Grant Golding, a Masters Graduate in performance at the Royal Conservatoire of Scotland, has performed as a trumpet soloist throughout the world. As a student at the RCS, he was featured with the BBC Scottish Symphony Orchestra, and has performed with Scottish Opera, RSNO and Dunedin Consort. He is also the recipient of Munster Musical Trust. 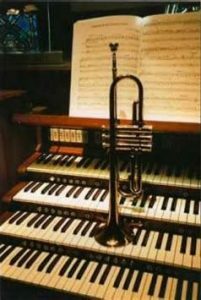 Working regularly as a recitalist with ‘The trumpet shall sound’ Grant’s playing can be heard at venues around the UK, from large cathedrals to small churches. Grant is in high demand as an educator and trainer across the UK. Steven is based in Central Scotland, and specializes in secondary school music education and also liturgical and choral music, performing regular organ recitals and broadcasts. Honours and awards won by Steven include the Flentrop Scholarship, Muriel Thorne Hague Prize, Sir Thomas Beecham Trust Scholarship, Lanfine Organ Studentship and Glasgow Society of Organists Trophy. Posted in Season 2017 - 18, St John's Church.